Some tips for indoor shooting and other thoughts from yoshimi the flying squirrel. 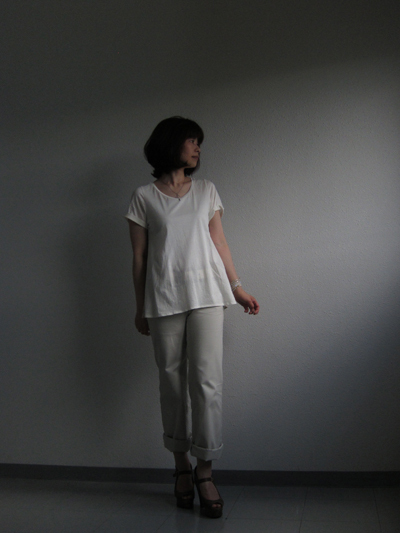 I'm recording my handmade outfit for Me-Made-May'14 challenge every day since May the 1st. Until recently, I was taking my blog pictures mostly in a dark emergency staircase because I was thinking it was the only space I could use for my photo shooting on weekdays. Now I changed my mind and I'm trying to take chances of outdoor photos on weekends as much as possible, though, the long and sad indoor experience grew some clues for taking outfit pictures in darker and closed spaces in me. Although I can't be very helpful for you who have healthy lights or already conquered similar conditions to mine, I think it might be helpful for some of you who are struggling with indoor photos right now. I'm going to share some of my humble ideas on it today. I am very happy if you find this post a bit helpful. Find the backdrop. Three angles to find your own. We tend to notice every item in a photo. I mean, the small electric socket there and the half opened curtain here. Especially in indoor photographs, such items can interfere with the attentions of viewers, even though we wouldn't care or look at them when we are actually on site. Eyes process much information to ignore the reality to "see" things efficiently, but they tend not to do it to the scenery in photographs. If you are a novice photographer and would like to get some simple and focused indoor outfit pictures, be conscious to find a frame that has miscellaneous items as less as possible, and have only some furniture that you can use as an effect in your frame. You need lights. But my suggestion is this. Never use flash lights unless you know them well. Find your place near a large window and use it as your illuminant from front-ish side. Indirect lights usually give prettier results, as far as I know. We can also use bounce lighting for pretty pictures, but it needs more explanations, so I leave it untouched today. If the camera has a zoom, photographs taken from distance using long zoom would bring so-called "better" proportions of human subject in the pictures. Find your place where you can keep distance between the lens and you. Put the camera at between the levels of navel and chest, and slant the camera upward slightest much, especially when taking from head to toe pictures. "Auto" can take pretty pictures, but if you are an adventurous amateur photographer and also if you have the function in your camera, try Portrait function and see whether you like it or not. More than sometimes the function gives smoother, brighter and prettier skin on the human subjects. I think no one has any problem with smoother looks of oneself in the pictures. Try longer exposure after trying to find a large window. I'd suggest to use AE mode to fix the lens aperture, and to try different exposures to check how your test photographs. You can fix the lens aperture to the smaller number, perhaps the second smallest one, so that you can get more light with shorter shutter speeds and also relatively shallow depths of field. Try "Automatic Exposure Bracket" to find the exposure of your favorite. Compact digital cameras have the function too. These photographs are my examples for test bracketing. I preferred +1 exposure to -1, and 0. I had a waist-high and large window on your right in the pictures. Then I tried a second test with +0.7, +1, and +1.3 to go into details. I chose +1.3 and continued the photo shoot with this setting. I didn't go further with much longer exposures, but of course you can try longer ones if you need. *The first set of three was taken by my Canon compact digital and the latter was taken by my Nikon DSLR with a zoom lens. I just wanted to show that we can do the same thing with whichever cameras that you own. Think of dropping but not keeping. Keep some but not all of the photographs taken, otherwise it may start coercing your freedom to shoot freely, eventually. Make some efforts for selecting very small number of better ones among many right after shooting. It grows the skill of choosing your camera setting too. Suspend white balance until next time. It all depends on the site. Just know that there are options and you can surely change the white balance etc for different temperatures. But it may be OK to learn it later. Last but not least, be relaxed. This is the suggestion 100% same as how Margo started in her brilliant blog post about taking outfit photographs. I cannot agree with her more. In my opinion pictures tell things much more than one would think. When talking about portraits and such, pictures are good at highlighting the smallest frictions when your facial expressions are not linked to your heart. They don't tell what exactly the situation in the "real" site is, however, people discern such and such over pictures and smell dubiety instantly. I mean, if you would like yourself smiling in the pic, you have to smile at heart. Otherwise people would sense that you're not smiling and you are pretending, which has the opposite effect. People are enough clever to distinguish shy smiles from pretentious smiles. If your face is looking at somewhere away awkwardly, people think you are resisting from telling how you actually are. I don't know how we do, but we do. If you would like viewers to be interested in you, you have to try to make efforts to be someone who is interesting instead of asking them to think that you're interesting. I'm blending into the flowers. I've been taking photos of my daily outfit every day for about half a month, as I'm joining Me-Made-May'14 as usual. I'm feeling very happy and also super busy! At Me-Made-May'14 Flickr group, I try to leave comments, "like"s or anything similar on other participants projects as many as possible, but it is quite difficult to commit it as much as I'd like because the party is huge. I think I need 50 hours in a day if I try to do everything I need/want to do in my life at this moment. My other blog, photo maisonette, with Carolyn is importantly having the final month for uploading our photographs too, and it makes me feel that time flies like a shooting star. I hope I am not going to be burned out like a shooting star, by the way, it is just a silly figure of speech. I love my silliness. 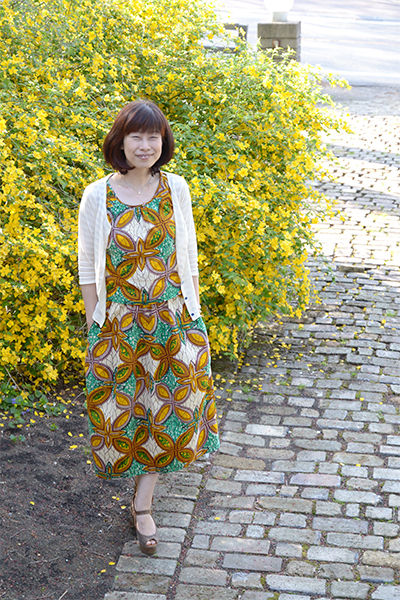 I sewed a skirt using my newly bought Eva dress pattern from Tessuti. 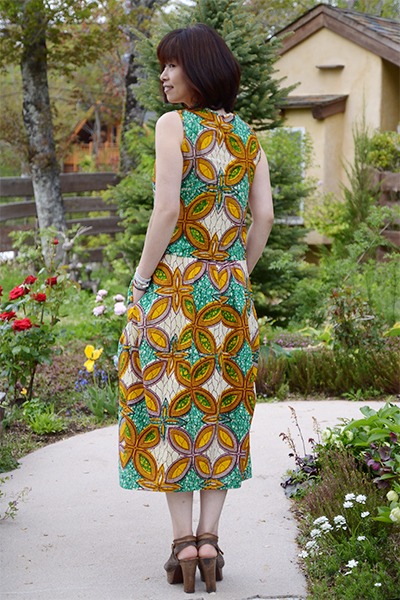 I was planning to make a dress at first, in this African wax print fabric, but I failed to make adjustments of the Eva's bodice in this kind of fabrics. FYI, Eva calls for softer fabrics and I am not saying that the pattern is difficult to fit using right fabrics. After making 6 unsuccessful toiles of bodice in similar firm cotton to my African print, I gave up a dress and made this skirt from Eva. I simply sewed the skirt and put casings for elastic at waist so that I can pull it on. 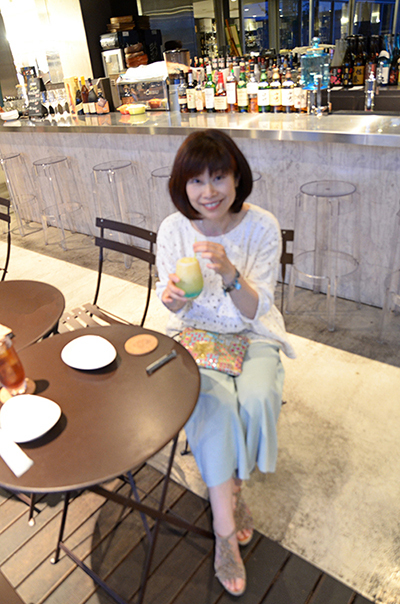 I made a tank top blouse with remnants too. I'm very happy with the result! 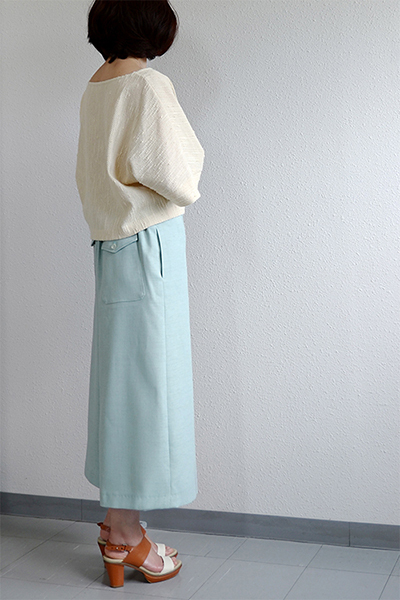 Eva's skirt is cocoon-shaped and I think it is very charming and worthy of special mention! Happy sewing to you, friends! The pattern is Shamrock from Tamanegi-kobo. 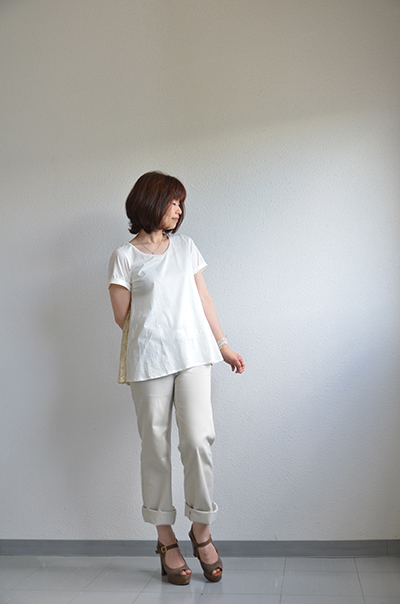 These wide culottes have an elastic waistband and they were easy to sew. I think I'll make more pairs in the future! The only alteration I had was for the back pockets. I added a pair of big patch pockets under the original mock flaps to make them less mock. Have a great month, dear sewists!